I’m not much of a gamer, but I do like gaming mice a lot for their typically superior tracking precision, more rugged construction, and comfortable ergonomics compared with “regular” mice. For the past half-year or so, I’ve been using a Razor Taipan gaming mouse at my office workstation, and a Satechi Edge Wireless Gaming Mouse for mobile laptop duty. Over six months of general duty use respectively both mice have proved to be excellent performers — precise and comfortable to use, and superior for non-gaming service. Gaming mice tend to be more significantly expensive than regular garden-variety rodents and the Razor Taipan does come with a premium $79.99. The Satechi Edge Wireless Gaming Mouse, however, sells for a price competitive with good quality general use mice — $24.95 — even with its deep feature set. Like most gaming mice, the Edge has multiple function buttons — in this case seven of them, multiple resolution settings, and more bells and whistles (see below). The operative question of course was whether the Edge Wireless Gaming Mouse could hold its own over the long haul with more expensive gaming mice. After six months of production use, I have no reason to believe that it won’t, and can affirm that the Edge is an excellent pointing device with no significant deficiencies or aggravations in terms of functionality having cropped up. Its initial apparent quality of materials and construction has also heled up, with zero problems or issues experienced. Is it on par with the Razor Taipan gaming mouse, which may very well be the overall best computer mouse I’ve ever used? Not quite perhaps, but the Taipan sells for more than three times as much. One of the most obvious distinctions between the two mice, besides the Edge’s substantial price advantage, is that the Edge is a wireless RF unit, while the Taipan is hard-wired, and with with a very elegant fabric armoured USB cable with a gold-plated connector at that. My usual preference is for wired mice, which have an objective edge (no pun intended) in terms of tracking precision. However, I haven’t detected any tracking deficiencies with the Edge mouse, which supports four different resolutions of 800, 1,600, 2,400, or 4,000 DPI, although not in the same league as the Taipan’s 8,400 DPI 4G dual laser sensors, and for ease and convenience in a mobile mouse, the wireless Edge has roped me in. 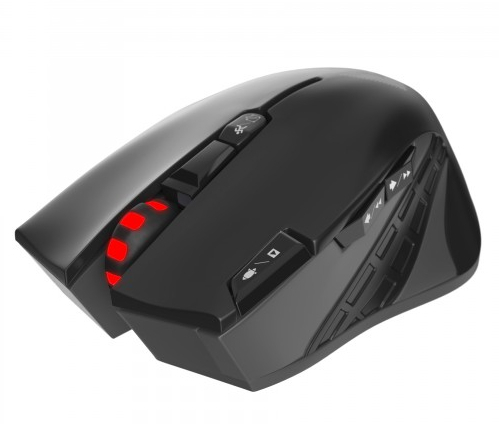 The Edge Wireless Gaming Mouse features a “Gaming Mode,” which allows users to press the “Turbo Button” to double-click with just one keystroke, eliminating the need to literally double-click. This saves gamers valuable seconds, which could mean the difference between a win and a loss. 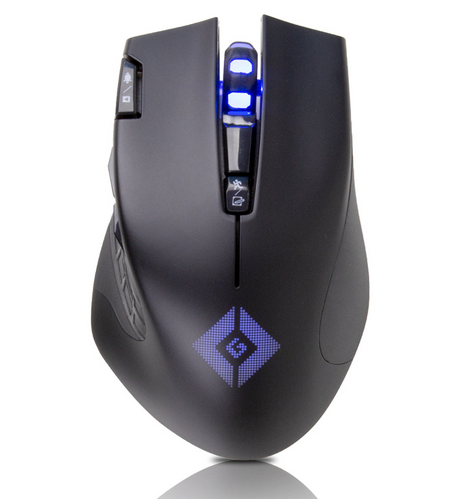 For added versatility, the mouse also has a “Video Control Mode” when not used for gaming. In this mode, the button functions switch into play/pause, fast forward/backtrack and clear screen buttons with a single click. While in this mode, the scroll wheel adjusts audio volume. 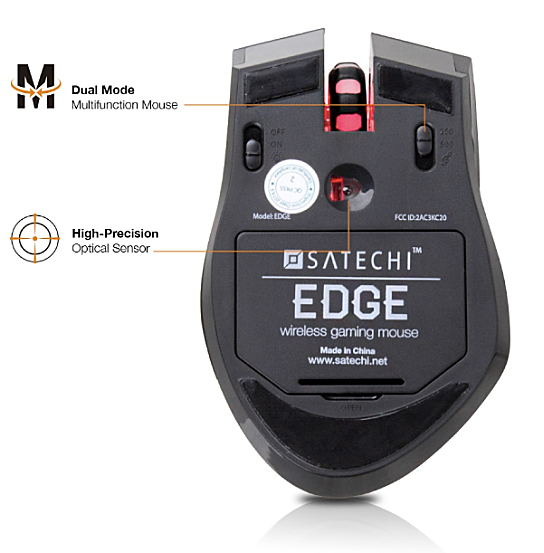 The Satechi Edge Wireless Gaming Mouse gives users freedom to enhance the mouse’s precision and speed with a single touch, adjusting the DPI between 800, 1600, 2400, or 4000 DPI. 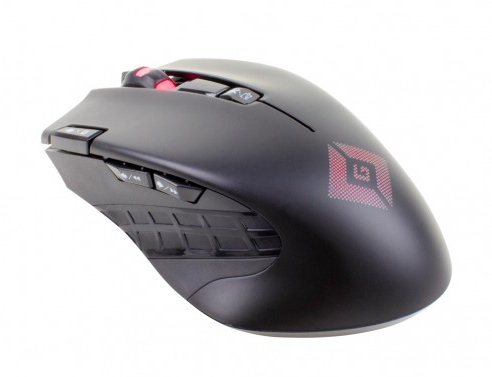 The mouse is built with user adjustable 250Hz or 500Hz of return rates on the speed of transmission between the computer and the mouse for latency-free response. I’ve noted no wireless latency to speak of, and I’m picky. Aside from the mouse’s optimized usability, it is also designed with sound ergonomics and maximum user comfort in mind. The Edge Wireless Gaming Mouse’s grooved grip enhances smooth, precise control with minimal mouse movement required. There are also naturally curved grooves for fingers and thumb to help with comfortable control of the mouse, and thus reduce strain. For my purposes, using the Edge Gaming Mouse with a 13-inch MacBook’s 1280×800 resolution display, 1600 or 2400 DPI seemed about right. The 4000 DPI setting is lightning, although would be great for those with a big monitor, and 800 DPI felt too slow after acclimatizing to one of the higher settings. Whatever, it just takes a click to switch among them. Very cool.Or if you prefer, the illumination can be switched off. 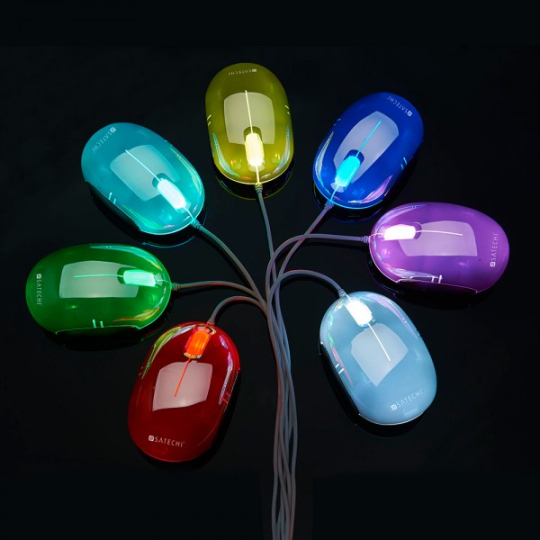 Incidentally, if you’re partial to mouse light shows, Satechi the $29.95 Satechi Spectrum Mouse Wired Optical Mouse, which, when switched to the On position, has internal LEDs that cycle through seven colors: blue, yellow, violet, turquoise, white, red, and green. To illuminate in a single color, switch to the Lock position when the desired color is achieved. The LEDs can be turned off by switching to the Off position. I digress. 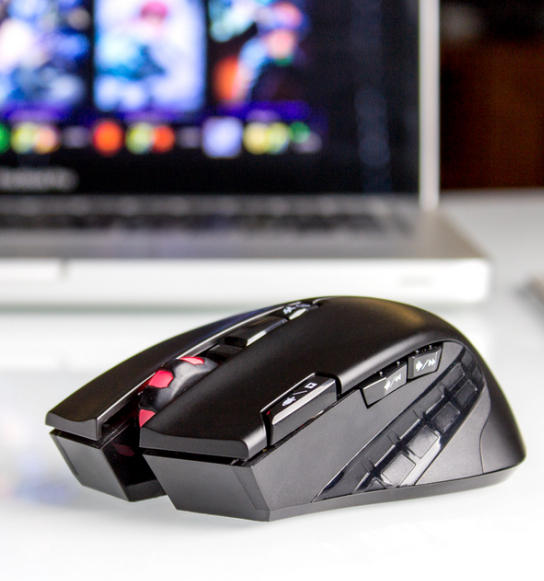 The Edge Wireless Gaming Mouse is powered by two AA batteries and features a power-saving chip, which automatically transitions the mouse into sleep mode after five minutes without use in order to maximize battery life. Satechi says this feature can stretch battery replacement intervals up to 36 months. However, I drained the first set of alkalines in about five months. The battery compartment also has a handy receptacle to house the USB port dongle when the mouse is transit or storage — handy for keeping track of it on the go. In summary, notwithstanding the friendly price, I’ve observed no evidence of corner-cutting in The Edge Wireless Gaming Mouse. It’s has performed flawlessly for me, and feels good doing it. 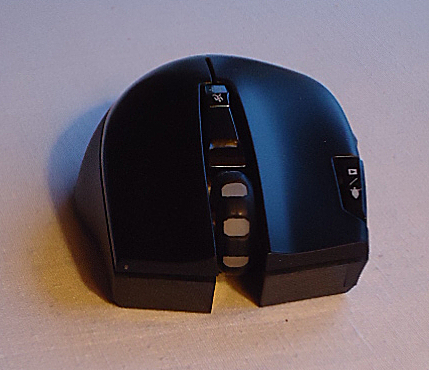 I often find the weight of the batteries in wireless mice creates more inertia than I prefer, which is a major reason why I’m generally partial to wired mice, but the Edge mouse doesn’t feel uncomfortably heavy. Substantial, yes, but in a good way. They got the button weighting about right as well, and the buttons have a quality feel in their action. Their action is perhaps a bit lighter resistance than some folks prefer. I like light button action, which I find less fatiguing in long sessions, but even I have to be careful about the Edge click buttons’ hair-trigger sensitivity. I do Like the effortless feel though. Compatible with both PC and Mac, the Satechi Edge Wireless Gaming Mouse represents excellent value at $24.95, and I can’t think of any reason to not give it a five out of five rating.